a positive attitude, keen to develop on what was a relatively successful previous year. Due to many of the squad becoming Old Hymerians, there was an emphasis placed on younger years, with the likes of Joe Smith, Yusuf Salim, Sashin Raghunath, Sam Elstone and Will Appleton all making the step up, with great success. 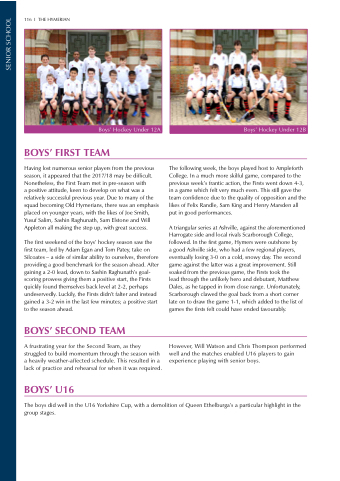 The first weekend of the boys’ hockey season saw the first team, led by Adam Egan and Tom Patey, take on Silcoates – a side of similar ability to ourselves, therefore providing a good benchmark for the season ahead. After gaining a 2-0 lead, down to Sashin Raghunath’s goal- scoring prowess giving them a positive start, the Firsts quickly found themselves back level at 2-2, perhaps undeservedly. Luckily, the Firsts didn’t falter and instead gained a 3-2 win in the last few minutes; a positive start to the season ahead. A frustrating year for the Second Team, as they struggled to build momentum through the season with a heavily weather-affected schedule. This resulted in a lack of practice and rehearsal for when it was required. The following week, the boys played host to Ampleforth College. In a much more skilful game, compared to the previous week’s frantic action, the Firsts went down 4-3, in a game which felt very much even. This still gave the team confidence due to the quality of opposition and the likes of Felix Randle, Sam King and Henry Marsden all put in good performances. lead through the unlikely hero and debutant, Matthew Dales, as he tapped in from close range. Unfortunately, Scarborough clawed the goal back from a short corner late on to draw the game 1-1, which added to the list of games the firsts felt could have ended favourably. However, Will Watson and Chris Thompson performed well and the matches enabled U16 players to gain experience playing with senior boys. The boys did well in the U16 Yorkshire Cup, with a demolition of Queen Ethelburga’s a particular highlight in the group stages.